The water meter installation crews were active in the area where I live for the last few weeks and yesterday they started digging outside my house. Therefore I guess I will have a water meter installed shortly. 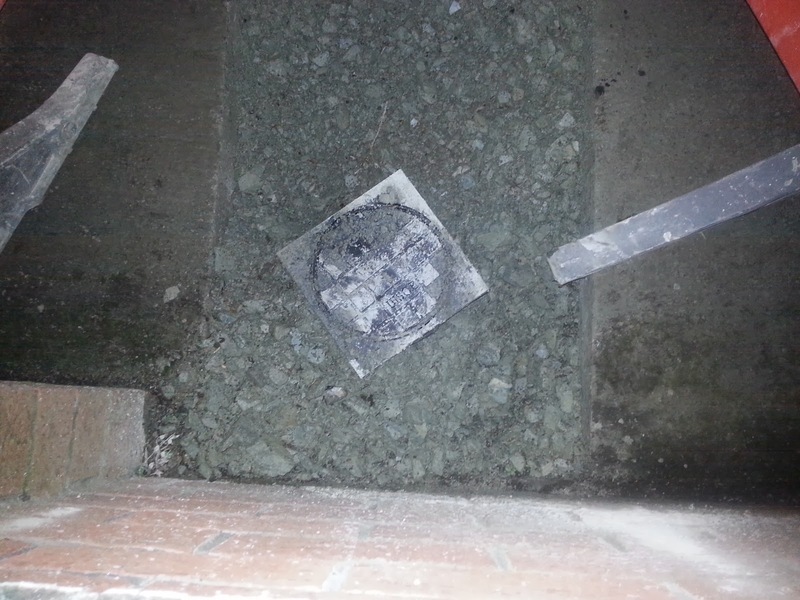 The crews seem to be very efficient at installing the meters and they clean up after themselves as well. Hopefully this is a sign that Irish Water is going to be a well run company. I guess that they got some value from spending all 50 million euros on consultants. Ride a Camel in Egypt (done that). My daughter (who has a degree in Psychology) has long been trying to convince me to try Mindfulness meditation. However, I must admit that I was very reluctant. Recently I decided to buy a book on the topic and try it out. To my surprise I found that it is really powerful. The concept of mindfulness is deceptively simple. All you need to do is to concentrate on what is happening with your body at the present moment. Typically you should listen to a taped guide who will advise you e.g. to concentrate on your breathing. It is surprisingly difficult to eliminate thoughts on either the past or the future - but with a little practice it is possible and the effect upon your mental well-being is astounding. 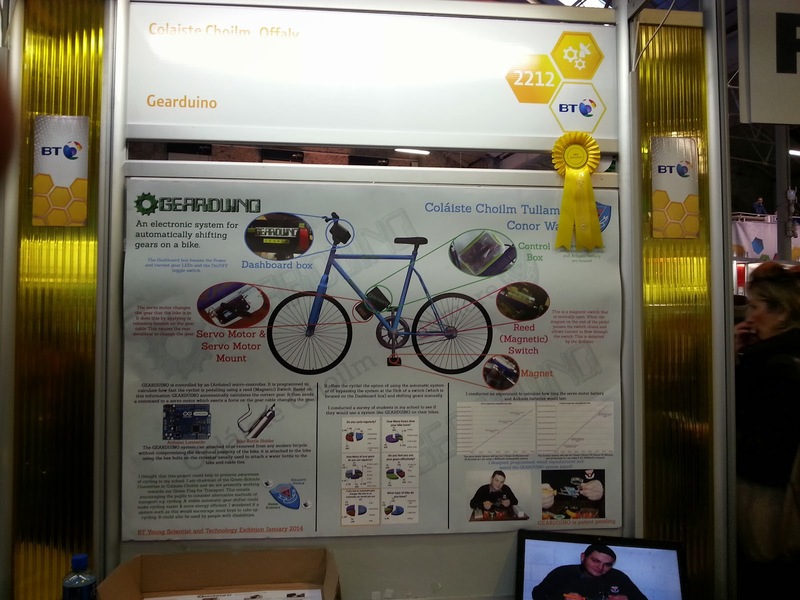 Gearduino - this project was effectively an automatic transmission system for bikes. It used sensors on the pedals and an Arduino based controller to determine when the gears should be shifted either up or down (hence the project name). The student who did this project told me that he has filed a patent application and once this is granted he will approach bike manufacturers to see if they are interested in bringing it to the market. As a regular cyclist I can easily how this could be a best seller. 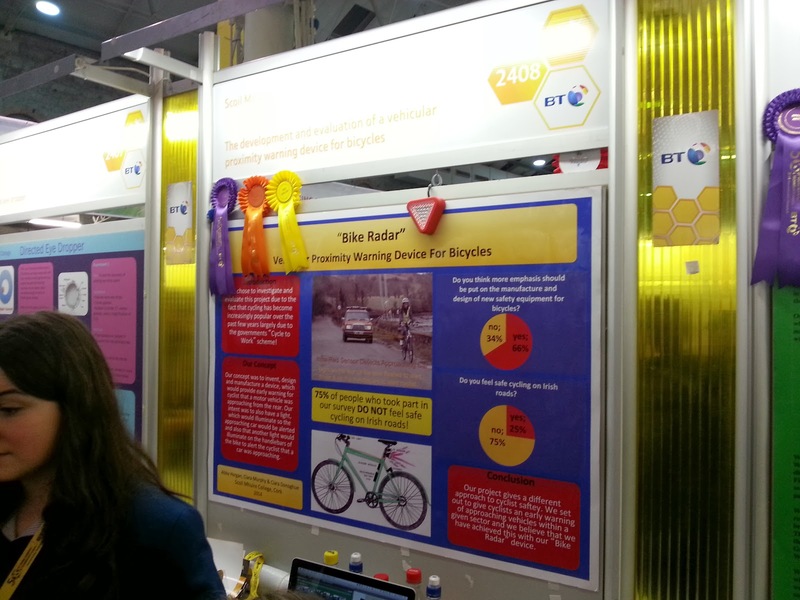 Another cycling related project was Bike Radar - I didn't get a chance to speak to the students responsible for this project, but it seems that they developed a warning system for cyclists to alert them to the fact that cars are potentially on course to collide with them. It sounds like a great idea and is similar to the collision avoidance system which are currently available on high end cars. A very useful project was Gum shield communication device for players and managers. 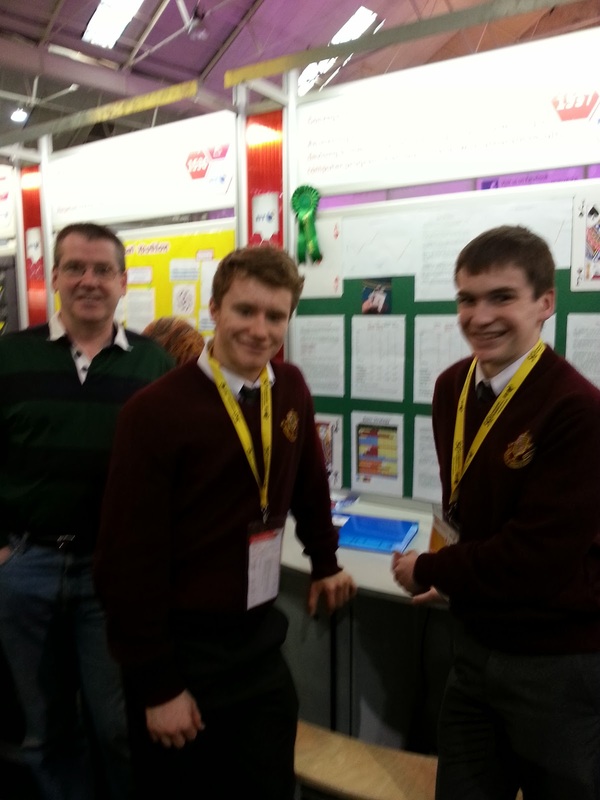 This project won the overall runner-up prize for developing a wireless communication device which could be embedded into a gum shield and would allow players to receive messages from the manager during the game. It seems to operate by generating vibrations in the gum shield which are then perceived by the player as sound waves. I can see this being used in several different sports. The entologic project developed a system which would tanalyse a program and turn it into a normal English explaination of what the program did. This should be useful for non-programmers who wished to understand what the program was doing. A similar project was Easy shell which developed a system for transforming a set of instructions written in normal English into a bash shell script which could be executed. I didn't get a chance to try it out, but the idea is definitely interesting. Last but not least I was interested to see New Method for Card Counting in Blackjack - this project developed an improvement on the classical method of counting cards to improve the odds in a game of BlackJack. 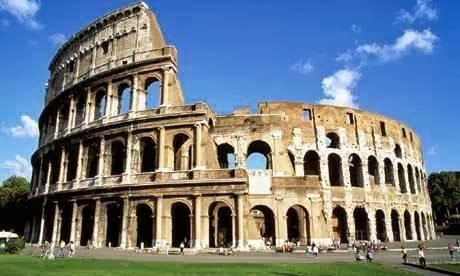 This project clearly has commercial potential. One of the students told me that his father has promised to invest in sending him to Las Vegas on a practical trial of the algorithm once he reaches the legal minimum age for gambling. Young people today are very familiar with Apps. However, most of them simply use Apps created by other people and don't realise how easy it is for them to create their own. The Apps4Gaps competition is an attempt to rectify this by offering young Irish people to develop apps which leverage open Data. The site provides links to the Irish 2011 census data feeds, but the rules seem to allow entrants to use any open data set to built their application. It seems that a number of organisations including the teachers organisations and CoderDojo movement are involved in prompting the contest. The closing date for registering your project is 31st of January, but you have until 11th of April to complete your entry. The web site is not clear about what the age limit is for young people. I wonder would I be stretching the rules if I entered an application (although I am 51 I feel young at heart). One of the presents that I got for Christmas was a book called "The Art of Happiness". This book was written by Howard Cutler (an American Psychiatrist) based upon his discussions with the Dalai Lama about his general philosophy on life. 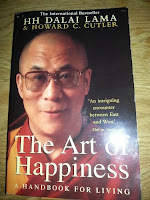 I found this a very interesting read because I have long been interested in the teachings of the Dalai Lama. Initially I was surprised to read that he though that the fundamental purpose of everyone's life should be to pursue happiness, However, his holiness makes a distinction between the pursuit of a temporary joyful feeling which can be a selfish pursuit and the pursuit of happiness which he claims can only be achieved by practising compassion and caring for other creatures. 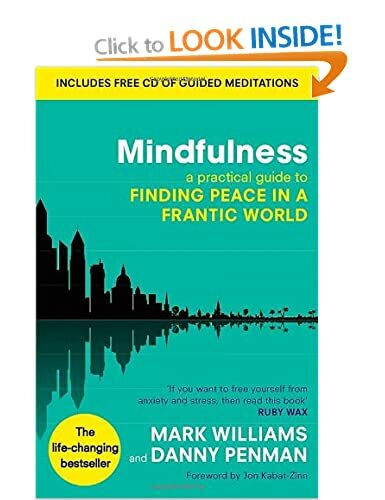 An interesting aspect of the book was the fact that the psychiatrist was comparing the Dalai Lama's guidelines for pursuing happiness with the quest that his patients back home were seeking a return to mental health. In many ways the Dali Lama's version of happiness corresponds reasonably closely to good mental health. Overall I recommend this book highly. I see that the cover claims that it is an international best seller so clearly many people have already read it.